A wonderful addition to salads, leaflets being the perfect size and the flavor so agreeable. Especially useful from Sept-April, a period when small aromatic herbs help diversify the winter salad. Really satisfying with chicory and endive. 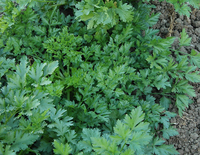 As with its cousin chervil, the harvest can extend into the bolting stage by use of tender stem tips for garnish and salad. 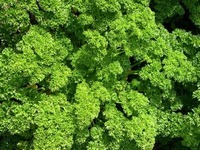 All of the umbel herbs are very high in antioxidants. Nectar-rich tiny flowers are a spring boon to beneficial microwasps.